Alchemy is one of the crafting systems available to the player. There are 7 possible types of potions: Healing (red), Revitalizing (Mana)(blue), Rejuvenation (Health + Mana) (white), Strength (orange), Dexterity (yellow), Intelligence (green), and Armour (purple). Strength, Dexterity, Intelligence, and Armor potions add a temporary amount to that stat. The magnitude and duration is based on the quality of the potion. Armour potions add points directly to armour ratings for melee, ranged, and magic equally, and the magnitude is greater than the effect boosting the associated attribute gives you. The armour effects stack with the armour bonus from the attribute potions. Each of these potion types comes in 10 possible qualities. 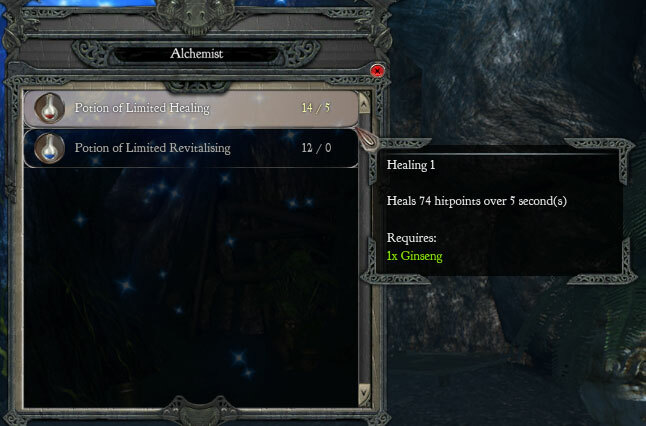 Heres an example showing the potency and ingredients for all 10 Healing potion qualities. Heals * hitpoints over 5 seconds. Each formula is composed of a key ingredient which determines what the potion does, and a potency ingredient. The combination of a specific number of key and potency ingredients determines the quality of the potion. 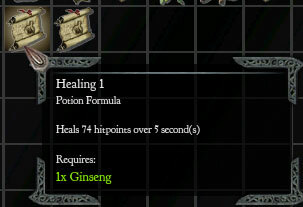 Ginseng is the key ingredient for a healing potion. Ingredients can be found from vendors, in containers, and in the world at large. Unfortunately, the distribution of plants is uneven, and they dont respawn. I believe that ingredients in a merchants inventory are one thing that do not replenish (well, not much, at least) when you level up. You might find one or two replacement plants, but if he had 10 and you bought them all, hell never have 10 at a time again. This can be unfortunate in the first half of the game, but irrelevant in the second half . You cant even reliably find plants in the wild. Some varieties are incredibly common, like Ginseng and Fatfern, but others are much harder to find, like Earth Root  for the common mana potion! And I dont think I have ever seen a Stardust plant growing in the wild, ever. Strangely, there are three types of plants which arent even used for anything at all: Oak Tears, Moonshine, and Holy Basil. (Holy Basil is actually used, but only with one alchemist). To save inventory space in the first half of the game, it is recommended that you only pick up items that you have an immediate use for. For example: If your character doesn't use Dexterity potions, don't fill your inventory with Fatferns. If you're in Broken Valley, you're unlikely to have the formulas which require you to use Fanny Blossoms, so don't pick those up. You learn new formulas by finding them among random loot or buying them from merchants. You need to take them to your Alchemist, after which theyre removed from your inventory. Any Alchemy formulas you have in your inventory after visiting your alchemists potion creation screen are duplicates of ones already learned  sell em. Unfortunately, the game does not let you see what you have and havent learned without returning to your alchemist, which is not always convenient, so if you want to keep track of that, make a 10*7 grid and do it yourself. If you switch alchemists later, your learned formulas carry over. Commonality: Very Common. Grows in most places with a temperate climate, can sometimes be found underground. Commonality: Uncommon. Grows in dry places, can be found in some caves. There is a rare Rotten Earth Root item in some places. It does nothing and cant be used in alchemy. Commonality: Rare. Grows in cold climates, and in some sewers. Commonality: Non-existent. Does not grow anywhere, as far as I know. Sometimes found in random crates, barrels and urns. Commonality: Moderate. Grows in temperate climates and underground. Commonality: Rare. Can be found in temperate climates, but not in large amounts. Commonality: Rare. Can be found in temperate and dry climates, but not in large amounts. Dont pick any of these up from the ground, and sell them if they wind up in your inventory. They are useless. Two Skills affect how youll use Alchemy. One is Potion Efficiency, which increases the potency of all potions, so you may need to use fewer. The other is Master Herbalist, which reduces the amount of ingredients you use when brewing potions. (again, isnt the Alchemist supposed to be doing the work?) Despite the description, this seems to reduce it by at least one ingredient per level, probably more for higher levels. All potions will still require at least one ingredient, though. Most potions are pretty plentiful from random crates (I think Full Armour potions are rare or can only be made at an alchemist.). Strength/Intelligence/Dexterity potions are useful for everyone because raising a stat also raises your resistance to attacks of that nature, and boosts your regeneration rate or damage you do from critical hits. After youve raided a dungeon or two you should find yourself accumulating a lot of potions. Use them as a fight starts (or before you start it). Dont bother saving attribute potions, or else youll discover that your precious 100 slot inventory is bloated with potions you never use. Armour potions are harder to find or can only be created yourself, so saving those for tougher fights isnt a bad idea. Most of these are self-explanatory, so Ill only mention the interesting ones. Map/Compass  This shows a portion of the local map. Friendlies are in green, hostiles are in red. Weapons Slots  In Divinity 3, you can swap between three sets of weapons. Ill probably put a very special bow in one slot once I acquire it. 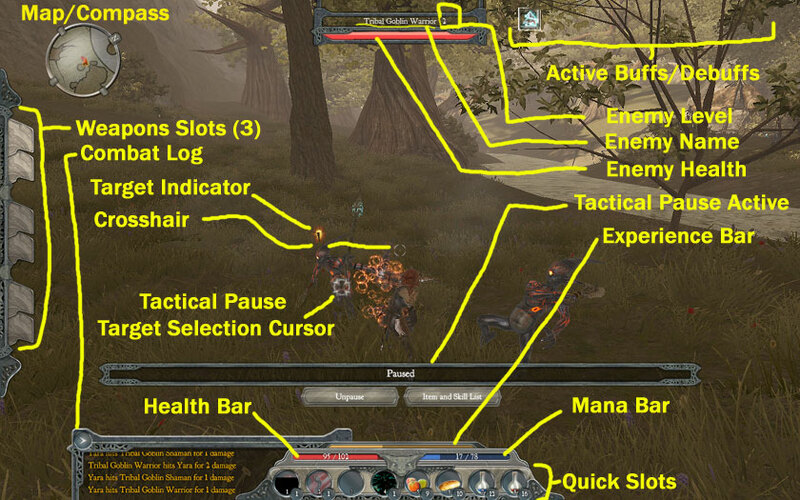 Combat Log  It details what happens in combat, damage, critical hits, status effects, experience. I usually leave it away because it makes the screen look untidy, I dont need this information, and I cant pay attention to this in the middle of combat anyway. I could leave it up for the screenshots, if readers want to know how much damage Im giving/receiving. Active Buffs/Debuffs  All status effects, good or bad, that Yara is under. This includes healing effects from consumables. The white line around the effect indicates the time until it wears off. When youre in Tactical Pause mode, you can mouse over and get information on how much longer the status will last, down to a tenth of a second. Tactical Pause  Like the previous two games, Divinity 2 is a game played in real-time, but with a pause you can activate at any time. The difference is that in this game, its seldom needed. Theres an option to have it automatically activate when your health reaches between 5 and 40%, but I turn off automatic activation entirely. Im well aware of my health, so if I die, I die. When you pause, if you hit an attack spell from a Quick Slot, it gives you a cursor and asks you to choose your target. Its not really needed for target selection since thats usually as intuitive as pointing your crosshair at what you want to hit. It could be useful if you want to be specific on what to hit, though, like if theres a weakened enemy or there are enemies between you and your desired target..
Divinity 2 gives you 8 Quick Slots to use for Skills, Consumables, or certain special items. 1. Skill on Cooldown  This skill is in cooldown mode. Once the blackness reaches the bottom and it lights up, it will become Ready. The number in the lower bubble indicates the level of the skill. 2. Ready Skill  This skill is ready to be used immediately, assuming the requirements are met. 3. Empty Slot  Nothing has been assigned here yet. 4. Insufficient Mana  This skill cant be used because of a lack of mana to cast it. 5, 6, 7, 8. Consumables  Food, Drinks, and Potions are consumables. Food restores health, drinks restore mana. Only one healing and one mana restorative can be active at a time. The number in the lower bubble indicates the number of items remaining.